The station is certainly one of the most recurrent locations in the film industry and, remembering old classics or films set in the past, you can not think of the image of the track and steam train departing or arriving. How to deny the charm of the locomotive with its puffs of steam, its carriages so retro, its “slowness” able to further extend the greetings, increase the emotion of those in the distance waiting for a return, let the passengers linger on every detail of the landscape beyond the window. Today it is still possible to immerse yourself in this vintage atmosphere thanks to the Nature Train, a steam train that will allow you to explore the Crete Senesi and the Val d’Orcia from a completely new perspective. In fact, it should not be forgotten that in addition to the charm of the train itself, the beauty of traveling lies in being able to cross some areas of this area of ​​Tuscany where there are often no roads, which means ensuring unique and absolutely unusual views. The area of ​​the Crete Senesi extends to Siena and is characterized by landscapes where nature seems to totally dominate man. The characteristic grey-blue color is determined by the conspicuous amount of clay present in the ground that at a glance makes it similar to a lunar landscape. Barren hills, calanchi and biancane, some farms isolated on the heights. The vegetation is characterized by oaks, cypresses and pines, crops limited to corn and sunflower. What best describes the Val d’Orcia are the hills covered by a dense vegetation of vineyards, olive groves, cypresses, beech and chestnut woods, interrupted by ancient villages of medieval origin, rural houses and fortresses with impervious towers that are dispersed in this quiet and isolated area. It is a territory of ​​great gastronomic richness: honey, pecorino cheese, truffles, mushrooms, extra virgin olive oil, cured meats and of course wine among which the famous Brunello di Montalcino stands out. 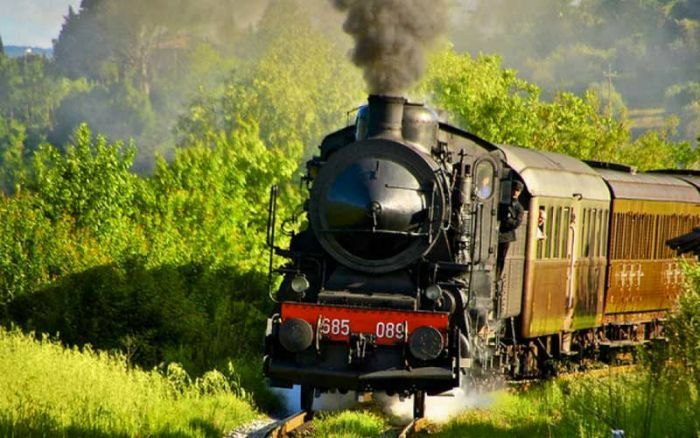 The “Nature Train” is the fantastic locomotive with original “centoporte” carriages of the time that will allow you to spend an alternative day in one of the most beautiful areas of Tuscany. Usually the train leaves from Siena, plunges into the most beautiful Tuscan hills and arrives in one of the villages of the Sienese countryside where there is a fair, a flea market, a village festival or other events dedicated to the typical local area. In fact, train journeys are always combined with a particular event. If a day immersed in the Crete Senesi does not seem enough, instead of returning to Siena in the day as expected by the program generally, you can extend your stay in a farmhouse in the valleys. We recommend the San Fabiano farmhouse. The San Fabiano farmhouse is located near Siena and offers apartments with kitchen, heated swimming pool and a common room with billiards, piano and an international library. What characterizes this place is the quiet that surrounds it, but it can be interspersed with many activities organized for guests: cooking lessons, drawing and ceramics, wine tasting, nature trails on the way of truffles, horseback riding and quad biking, archery. Curiosity of the place: at the request of the guests the apartments can be “made kosher”, from the crockery to the supply of food.